PR News celebrated the winners and honorable mentions of its 2013 PR Agency Elite Awards at a luncheon held at the New York’s Grand Hyatt on Dec. 10, 2013. The awards benchmark excellence in PR agencies’ key practice areas, and point the way forward for these agencies to compete in media environment in which the lines between public relations, advertising, marketing and publishing are blurring. Winners were announced in 23 practice areas and categories, among them Business to Business (co-winners, Finn Partners and Miller PR), Cause/CSR (winner, Cone Communications), Digital/Social Media (winner, MWW), Integrated Communications (winner, Peppercomm), Internal Communications (winner, Weber Shandwick), Media Relations (co-winners, Fuse and Lippe Taylor) and Web Site (winner, Makovsky). Marian Salzman, CEO of Havas PR North America, was the winner of the Agency Awe Professional Award, which honors an agency professional who has significantly raised the bar on excellence for both clients and for their agency itself. The honorable mentions in the Agency Awe Professional category were Ilene Adler of Vantage PR, Stephen Bonsignore of Cohn & Wolfe, Huma Gruaz of Alypaytac Marketing Communications/Public Relations, Michael Kempner of MWW and Daniel Simon of Cognito. Aliza Licht, SVP, global communications for Donna Karan International (aka DKNY PR Girl) took a break from Fall Fashion Week (as did awards co-presenter Iris Yen, VP, communications for American Eagle Outfitters) to keynote the awards luncheon. Licht spoke from the brand perspective on how to strengthen the agency-client relationship. Most important, she said, “it should never be us vs. them. Collaboration is essential no matter what happens." 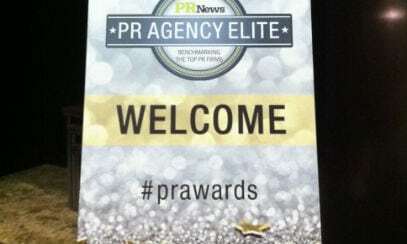 PR News congratulates all of the winners and honorable mentions of the 2103 PR Agency Elite Awards. Fraser’s Hands-On Health Express on behalf of First 5 California—a traveling interactive health exhibit that engaged kids in educational activities while connecting parents to free resources and local support—helps to illustrate the agency’s approach to advocacy PR. Henson Consulting’s rebranding of the Illinois’ unclaimed property program as I-Cash provided solid returns for Illinois, with a 185% increase in visits to the unclaimed property website and a 383% increase in the number of property claims filed within the first three weeks following the launch of the PR campaign. Miller PR’s efforts on behalf of Starlight Runner Entertainment, a New York-based production studio, demonstrate its modus operandi: development of thought leadership and trend topics that position its clients for innovation. According to the 2012 Cone Communications Social Return Trend Tracker, 86% of Americans said that they are more likely to trust a company that reports its CSR results and 40% of Americans said that they will not purchase a company’s products or services if CSR results are not communicated. With these trends in mind, Cone created Corporate Social Return, which is designed to provide clients like Hilton Worldwide, Green Mountain Coffee Roasters and Time Warner Cable with both a roadmap and measurable results for their CSR programs. To assist Darden Restaurants in sparking nonprofit efforts in local communities, Edelman helped to create Darden Foundation’s Restaurants Community Grants Program, which awarded more than $1.7 million to nearly 900 nonprofit organizations across the U.S. and Canada. Waggener Edstrom took its charitable efforts up a notch, contributing $1.4 million to nonprofit organizations, or 1.18% of the company’s total fee revenue, and while the company set a goal of motivating at least 60% of its employees to use a portion of their 16-hour volunteer benefit, in 2012 78% of Waggener’s employees jumped on board. Airfoil created and distributed a “State of the Stache” survey and infographic to drive awareness of the Movember organization, whose mission is to halt the growth of men’s cancer, and whom Airfoil identified as a strategic partner for client SurveyMonkey. Content from the campaign reached more than 800,000 people and the team was able to directly contact people within SurveyMonkey’s target marketing demographic. APCO’s global crisis team combines the experience of seasoned PR executives with a comprehensive package of proprietary analysis and crisis management tools that guide companies of all stripes through the entire crisis and litigation communications process. MWW excelled in the social-digital space with campaigns like Driving Social for Subaru and the McDonald's Nutrition Network, both generating millions of impressions online and while bringing the conversation offline. In just eight months, the team at Peppercomm and client Tyco built an integrated “new company” launch strategy to guide every stakeholder through the process of the splitting of Tyco into three separate companies. For the Day One of the new Tyco campaign, Peppercomm conducted an employee and customer ‘listening’ effort to find out how they were feeling about the separation and what they wanted, and drawing on its proprietary measurement system, Peppercomm analyzed media coverage to understand the current perception of Tyco. Weber Shandwick had three objectives as it sought to reposition: create more efficiency, increase productivity and encourage engagement. With those goals in mind, a committee comprised of senior management, HR, business development, IT and corporate communications created MyWeberShandwick (MyWS), a social intranet system that transformed the agency's internal communications. In an industry rife with competition, coming out on top with best-in-class marketing communications takes a unique blend of talent, creativity and hard work. Waggener Edstrom showcased all three in its campaigns, including Microsoft Does Fashion Week, Tweet-a-Beer and the Windows 8 and Surface Launch. Biosector2 (B2) teamed up with Grammy Award-winning singer Jon Secada to fight hepatitis C among Hispanic-Americans, generating millions of impressions. The campaign is ongoing and continues to impact the community while promoting awareness of the disease. Whether it’s working to stop girl-on-girl bullying, giving mom a moment in the spotlight or encouraging college women to proactively consider contraceptive options, Marina Maher Communications knows how to reach women and get results. Fuse’s PR efforts surrounding the 2012 Dew Tour earned over 100 million media impressions, with an additional 9.7 million impressions garnered through social media. Lippe Taylor turned Wayfair.com, a relatively unknown high-potential retailer, into a household name through broadcast coverage, product placement and online campaigning. rbb PR created a powerful public relationship program that connected the Ringling Bros. and Barnum & Bailey Circus with an untapped American audience of Hispanics. The program exceeded all objectives, with ticket sales increasing an average of 7% in the top four Hispanic markets in 2012, and more than 201 million media impressions. Momentum Communications Group developed a unique media training methodology that produced billions of impressions for clients such as Knowles Science Teaching Foundation and the Siemens Foundation. An effective product launch can be a tricky endeavor–especially in the highly competitive and highly fragmented world of video games. But Cohn & Wolfe was more than up to the challenge when it came to launching the hit titles Assassin’s Creed III and Just Dance 4. MWW rolled out a schedule of “thought starters” that would enable the agency’s reps to lead industry conversations about emerging trends in the marketplace and the “stories of the day.” Throughout the last couple of years, the agency’s senior managers were liberally quoted in both trade and mainstream media, including CNN, Forbes.com and The New York Times. The agency’s “Thought Leadership” strategies have had a positive impact on its clients’ businesses and elevated Weber Shandwick’s own reputation. Campaigns such as its Civility in America survey has given Weber Shandwick a forward-thinking thought leadership platform that goes well beyond the PR industry. The Marcus Group provided a free year of PR services to musical not-for-profit, Little Kids Rock. The agency increased the charity's media placement by 40%, garnering 72 press mentions and drumming up media placement in previously dormant markets. MWW takes its client efforts and uses them to serve the reputation management industry as a whole. 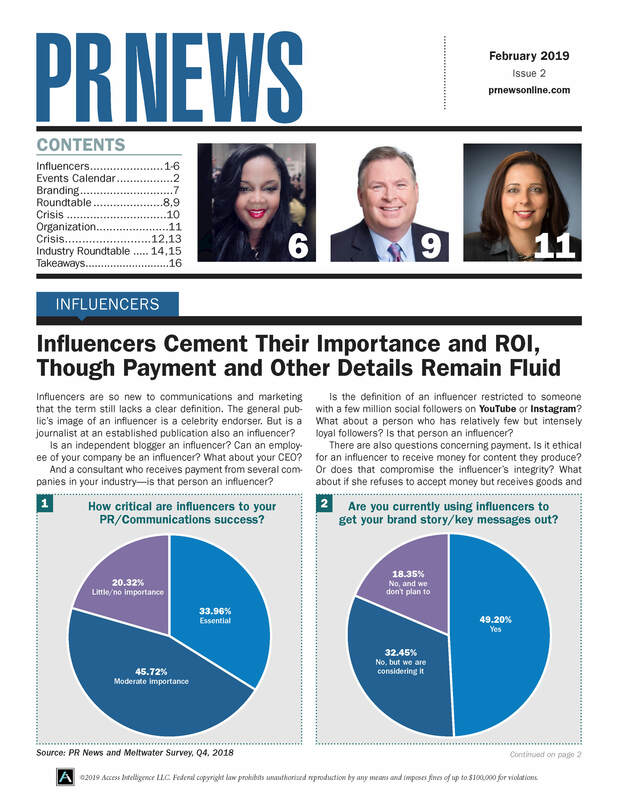 The agency’s blog, Return on Reputation, for instance, gives MWW executives a vehicle to communicate with both industry professionals and the public and share insights on a variety of topics. To ensure that its employees continue to grow and strengthen their connection to the company and colleagues across the country, MSLGROUP created the Agency Enrichment Program. Using technology like Web-conferencing, video, live audience polling and open-ended discussion through a chat feature, MSLGROUP was able to host participants across 10 network offices throughout North America. Makovsky created a new design for its site that was more simple, crisp and clear to potential clients. Following the overhaul, Makovsky was able to close nearly one out of every three sales leads.